How do you react to a person whose actions send a contradictory message? I laughed one day when I saw the manager of a local fast food place carrying bags into her restaurant from the fast food place across the street. I teased her the next time I saw her. She just shrugged and said, "Some times you just get tired eating the same thing all the time." I don't blame her for wanting to have some variety in her diet, but stop and consider the messages she just sent: "The food here is OK, but for special occasions I want the other stuff." Or, "The food here gets boring after a while." Someone driving by might conclude that if a restaurant owner eats at another place, the other place must have better food, and a restaurant owner ought to know the good places. Our first-family in this country has been justly teased about their talk of healthy eating and making a great show of it, but then the next thing you know they're seen enjoying the junk food the rest of us enjoy just as much. 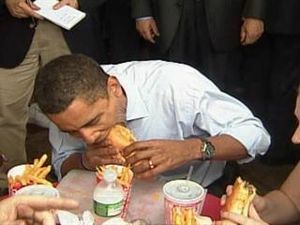 (See: "Next, Michelle Obama's health reform plan for the nation's restaurant menus and families dining out" and notice the subtle message shown half-way down in all the pictures of the President eating "unhealthy" food.) The point isn't a stab at the President or his wife, but an illustration of why people aren't taking this particular message seriously. There is a lesson to be learned here. It is so easy to talk about what other people ought to do, or what we should be doing (with emphasis on the "you" part of "we"). But why should another follow if you aren't first successful at it yourself? How does a wife, or husband for that matter, demonstrate the desirability of being a Christian? "Wives, likewise, be submissive to your own husbands, that even if some do not obey the word, they, without a word, may be won by the conduct of their wives, when they observe your chaste conduct accompanied by fear" (I Peter 3:1-2). Your spouse sees your actions. Your actions speak greater volumes that your words ever can accomplish, but what happens when your actions are inconsistent? How do you convince your spouse to devote his life to Christ when you demonstrate that Christ isn't that important to you by your haphazard attendance? Where is the appeal when you act one way in church and a different way at home? "Let no one despise your youth, but be an example to the believers in word, in conduct, in love, in spirit, in faith, in purity" (I Timothy 4:12). How does a young person encourage an older brother to do better? It isn't by what you say ought to be done; it is by what you accomplish in your own life. What you do needs to show a steady consistency with good results so that others want to be like you. Paul understood the weighty message of an example. "For you yourselves know how you ought to follow us, for we were not disorderly among you; nor did we eat anyone's bread free of charge, but worked with labor and toil night and day, that we might not be a burden to any of you, not because we do not have authority, but to make ourselves an example of how you should follow us" (II Thessalonians 3:7-9). He did not teach anything different from how he first demonstrated with his own behavior. His behavior was consistent, and the encouragement he gave was consistent with his behavior. We see so-called leaders in the world, who really don't lead; they push. They dictate what other people ought to do, but they themselves are not following the same path. We don't need dictators in the church, we need leaders -- people who show the way by going first and encouraging others to follow. "Remember those who rule over you, who have spoken the word of God to you, whose faith follow, considering the outcome of their conduct" (Hebrews 13:7).